There are days when exciting things happen and there are many more days when nothing at all happens. The other day was a day when something happened. Our Employment Authorization card has arrived and we have officially gotten excited about the idea of working although the card should serve as a bit of a joke since our economy is anything but good. Haha. It is getting better, I should not be so negative about it. We can check our status online but it's still exciting when something happens physically. Our next stop will be the arrival of her green card which will mark a very important day in our lives and in the process of immigration in general. Immigration is a big deal and it has not been easy. Thanks to the good folks at VisaJourney we have been able to file everything without need of an attorney. 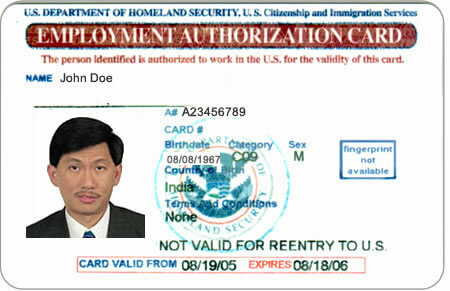 This is all in connection with the broader scheme of immigration which was begun by starting the K-1 visa process, arriving in America and marrying within 90 days, and then following up with an Adjustment of Status (I-485) which often goes along with Employment Authorization, or EAD (I-765) and Application for Travel (I-131), which is also known as Advance Parole--this can cause you loads of trouble if you do not do it in advance, possibly invalidating your visa if you leave without it! Today....a small victory. Tomorrow, well, we're awaiting the arrival of our elusive green card.